Photo courtesy of The Auk. Amadon was a leading ornithologist during the middle years of the twentieth century. After joining the staff of the American Museum of Natural History he came under the influence of Ernst Mayr, and ended up sharing a number of Mayr's interests and researches in the ecology, biogeography, and evolution of birds. Amadon was a renowned expert on birds of prey, and his Eagles, Hawks and Falcons of the World is no doubt his most important scientific study; another important work, however, was his doctoral program investigation of the evolution of the honeycreepers, a family of birds endemic to the Hawaiian Islands. 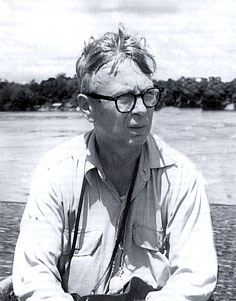 Amadon also spent time in the field in the South Pacific, Philippines, Africa, Venezuela, and Australia. Among his popular audience-oriented works was his 1966 book Birds Around the World. --born in Milwaukee, Wisconsin, on 5 June 1912. --dies at Tenafly, New Jersey, on 12 January 2003. --The Auk, Vol. 120(4) (2003): 1195-1198. --Ibis, Vol. 145(4) (2003): 716.